HomeUncategorized[NEWS] Back by popular demand – NANTA (COOKIN') returns to Singapore with limited shows! Singapore, July 2012 – High-energy theatrical spectacle NANTA (COOKIN’) celebrates its 15th anniversary with a returning performance in Singapore, this time at a world-class venue – the Sands Theater, Marina Bay Sands. 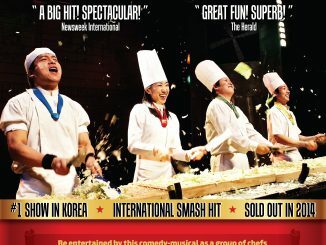 Since its international debut in Korea in October 1997 and at the Edinburgh Festival in 1999, NANTA (COOKIN’) has been seen by four million people in more than 250 cities in 41 countries and continues to be one of the most consistently popular shows in Seoul. NANTA (COOKIN’) performed four shows in Singapore in 2010 to sold-out crowds. They will return to Singapore this September with double the number of shows in 2010. NANTA, also called “Cookin’“, originates from the traditional Korean music performance samulnori, which is performed with improvised instruments like chopping boards, water canisters and kitchen cutlery. The backdrop of the show – a kitchen – may be nondescript and the main cast comprising four mostly regular-looking chefs may deceive audiences but wait till they begin their knives-tossing and utensils-flipping acrobatic stunts. The plot thickens when the chefs discover that they are being put through a challenge of preparing for a last-minute Korean wedding banquet while the manager puts his incompetent nephew in among the kitchen staff. The 90-minute almost completely non-verbal performance is chock full of acrobatics, comedy, magic and pantomime that will keep audience continually involved, entertained, and enthralled. As they cook, the foursome turns the stage full of kitchen items such as pots, pans, dishes, chopping boards, brooms and knives into rhythmic percussion instruments. When the food and fun stop flying, the performance culminates in a feast that some lucky audiences get to sample (while the rest get to leave the show smelling of delectable Korean BBQ!) – talk about a show that engages the five senses! “NANTA (COOKIN’) has thrilled and entertained audiences all over the world, and we are happy to celebrate this milestone and bring them back here to our shores, this time together with our co-organising partners Base Entertainment Asia,” says Kelvin Goh, Director of Red Spade Entertainment. Note: For group sales and information, please call Showbiz at 6688 1029. For more information, visit http://www.marinabaysands.com/!